WAFFLES: Everybuddy was SO nice yesterday, leaving lots of comments and purrs for the Boss on account of she doesn't feel good. 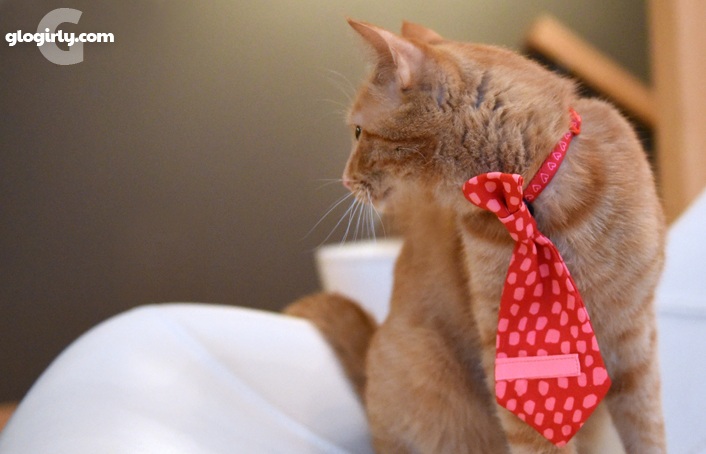 So I decided to put on my valentine tie and read her a poem I wrote. WAFFLES: Uh, Boss? What are violets again? KATIE: Blue, Waffles. Violets are blue. WAFFLES: But what's a violet? I mean, is it like chicken? Or turkey? KATIE: Would you seriously eat a blue chicken??? KATIE: This is a pretty lame poem, Waffles. WAFFLES: Ok, sorry Boss. I'll start over. I love you like chicken, Boss! We're all so very touched by your encouraging comments of love and the power of your purrs. Thank you. I'm eating a little bit more today and drinking plenty of water. Glogirly is trying out little tastes of some new foods with me. She says it's probably going to take me a while to figure out that the new food is, well... food. But she's very patient. 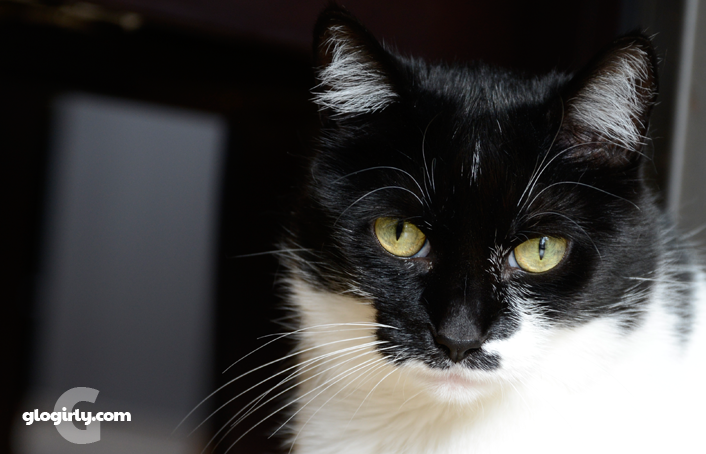 We're learning that lots and lots of kitties live perfectly well and happy with IBD. It takes a little while to figure out the right combination of food, but it's very manageable. So I'm not worried at all. And you shouldn't be either. A very dear friend of ours has also been doing daily distant Reiki sessions for me. I'll be sure to tell you about them sometime soon. Katie, we are glad that you're feeling a bit better. We're going to keep sending love, purrs and prayers, okay? That is one sweet poem, Waffles. Katie knows how much you (and all of us) love her! I'm so glad that your human has a handle on how to care for you, Katie! I'm sending both her and you purrs (and some to Waffles too - he needs help in the poetry department), and I hope you are feeling WAY better soon! *swoon* If Katie isn't up to it, I'll be your Valentine, Waffaliscious! 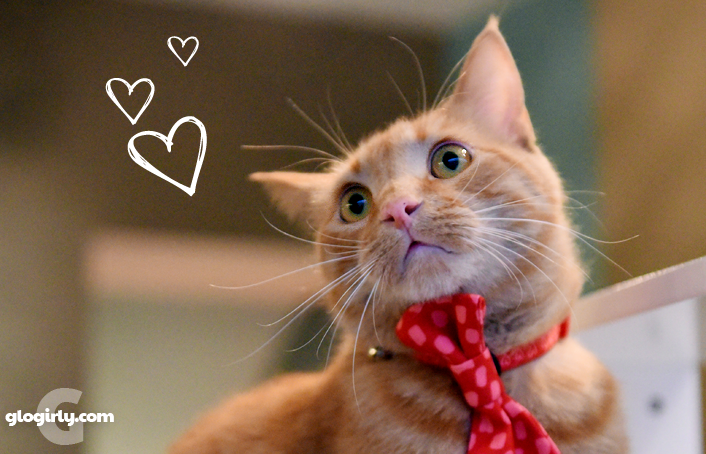 Waffles, you have a heart of gold, too! Katie, our Mommy has IBD and she says (for her) an attack generally lasts 4-5 days. So we hope the inter-species thingy holds and you're on the upswing! Purrs for your hurty guts from all of us. Waffles, you kinda need a little help in the poetry department. Not everything has to have chicken in it! Really! Katie, glad you are working on dealing with your problem. 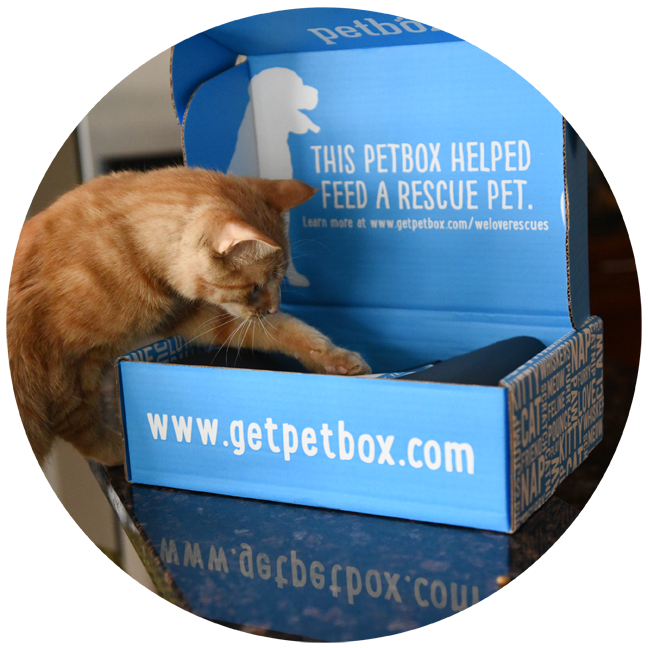 We will continue to purr and send headbumpies especially for you. Waffles needs a brain, and we don't have one of those to spare. You keep on getting better, Miss Kaite. Me and the Ham are both purring for you, and if you need me to come over there to give you some medicinal SMOOCHIES, you just say the word. Dat wuz sweet Waffles. Even if it made me hungry . . . I hope you feel better soon, Katie! Wow! If Waffles loves you like chicken, Katie, then you are much loved .... or look like a snack ..... Oh dear!!!! That was a lovely poem, Waffles! We're sure that Glogirly is doing a great job of finding the right balance of foods and other solutions that work for Katie, because she loves you both bunches...and we love all of you, too. Lots of purrs and hugs until things are back to normal again. The important thing is that you tried, Waffles. Your next poem will probably come much easier to you,,,,,and at the very least,,,,,you look so charming in your tie ! Wow - Waffles love Katie like chicken??? That IS impressive. That is a VERY special poem Waffles. Katie knows you love her even if you drive her a little bit crazy. Waffles, you are very sweet to think about Katie. Katie - we didn't know till just now you weren't feeling well. We're sending you lots of purrs and hugs to feel better. You're right, lots of kitties live purrfeclty fine with IBD and so will you! Smooches! That was a very sweet poem Waffles. Glad you are doing a bit better Katie! Ok Waffles - you be nice to Katie. She not gonna feel well until they figure out her food. All her pals are purring for her and depend on YOU to be a good brofur and keep vigil at her side. That's a beeYOUtiful poem, Waffles. It's from the heart, which is what matters! Great poem Waffles. Sending more purrs for Katie. 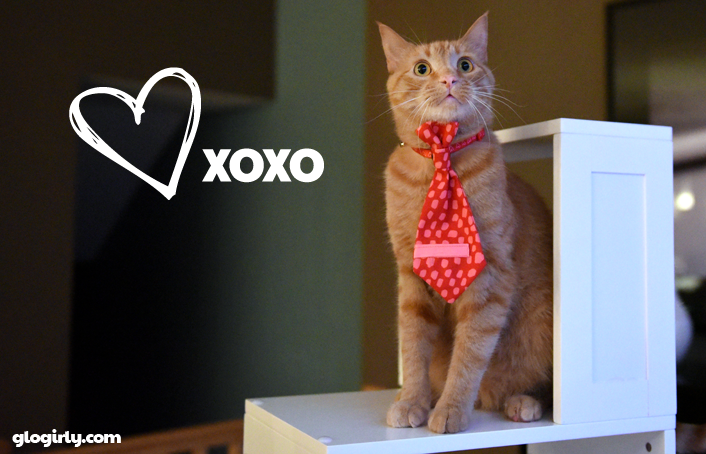 We're joining Waffles in sending love to the Boss! Katie sweetheart, we've been living in a cave here and just found out you are on the sick list. So very sorry to hear that, but at least you have a diagnosis, so now you have something to work towards. We have you in thoughts and prayers, and I'm purring like crazy for you sweetheart. Waffles, when you finally got to it, that was a very nice poem! That was very sweet Waffles. Purrs to dear Katie from all of us. Very sweet poem Waffles, our mouths are watering! That was a lovely poem for Katie, and she knows you love her Waffles. I am glad she is feeling a little better. My vet suspects I have IBD caused by the prolonged diarrhoea and bad reaction to my thyroid pills. Did you sign up for Athena and Marie’s FB Reiki group. I’m not sure what it is but I may need it someday. You know, Katie, I was diagnosed with that a long time ago from the quack vet I used to go with even though I had no symptoms. Sending you healing purrz and some tape for, you know what to do with it. Katie, I am glad your condition is treatable. Waffles, very nice poem and tie. Waffles, That was real nice. I think you loves your bis sister. But they don't taste very good. Oh, so you don't think that's a very good poem? Well, it's true isn't it??? Anyway, I am very happies to hear you are eating a little and drinking water. The Human and I are purraying you'll find some foods that you like pretty soon. We think you will, and then Waffles will prolly try to steal it. We are really glad you are feeling better! Waffles, you really surprised me. I'm usually with Katie here, but that was a very sweet poem. So glad you are doing a little better, Katie. We hope that it'll get sorted out. Are you on a raw diet? My sister has to eat rabbit and not bison because it's leaner and better for her kidneys. 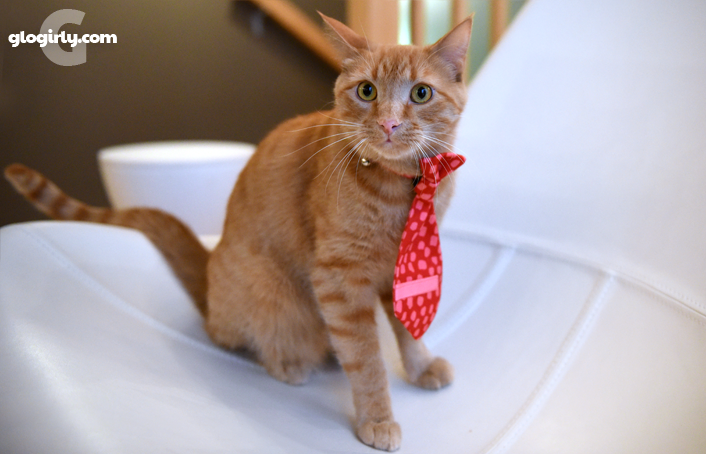 Waffles your poem was so sweet and you look quite handsome in your tie! So happy to hear that Katie is doing better...we have a great feeling that she will "figure out" that food soon! Waffles you have a chicken shaped heart!! So sweet!! Allie: Love you like CHICKEN? That is SO like a boycat. Waffles, that was a very sweet and heartfelt poem. We are pretty sure Katie appreciated it. We are happy that Glogirly and Katie are working together to figure out which noms are best for her. We continue with our purrs and prayers. XOCK, Lilly Olivia, Mauricio, Misty May, Giulietta, Fiona, Astrid, Lisbeth and Calista Jo. Waffles, that was a beautiful poem. Katie--Z-Girl says to tell you that she has troubles with food too and it can take awhile to get the food combo just right. When you do life is so much better! Here's to feeling better!